I have detoured the world of architecture and planned exhibitions to enjoy things I encountered by chance. The detour following the diagonal line from architecture has led me to a keyword of “Life Style”. I have searched answers to such questions as what the better ways of living and working are, what the real richness of life is and what happiness is in the rapidly changing societies where values and options have become more diverse than ever. Such exploration has made me interested in the living styles of the people in the Scandinavian countries and the societies supporting them. Scandinavian societies started improving social welfare systems and creating frameworks to offer women greater opportunities earlier than many other countries. They are always ranked high in gender index reflecting gender equality there. Among them, Finland ranks first in the world in terms of happiness of people＊1. Here in our exhibition this time, we focus a “baby package”＊2 Finland, the country kindest to mothers＊3, gives to a baby to be born. The objective of a baby package is to provide mothers benefits when they have babies to congratulate and welcome their new life and to offer equitable and adequate living environment. There is no income limit for the benefit but mothers need to receive health check-ups during pregnancy at neuvola or at a health care institution. It is said to help early identification and prevention of risks, leading to the lowest level of infant mortality in Finland. I believe the baby package reflects basic value of Finnish society that babies are the future of the nation and are cared by the society as a whole. Childcare is the responsibility of all citizens, whether they have their own children or not and whether they are men or women. In Finland, there is no such word as “IKUMEN” since it is quite natural that fathers participate in childcare. There are other benefits and leaves for parenting offered in Finland to support parents other than a baby package. Either a mother or a father can take “parenting leave” and “fathering” leave promotes participation of fathers to childcare. Eighty percent of fathers take the leave. High quality nursery care and free education are offered so that both parents can enjoy work-life balance under the equal gender relationship. It is important to help women work as an active member of society while having family and children. The condition is considered to be the most important component of an affluent society. Power of design is an indispensable component in creating the affluent society of Finland. 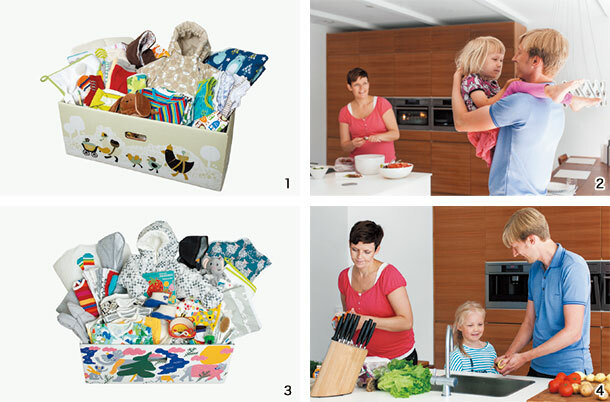 A baby package, the first gift to a baby, is beautifully designed with a functional box to serve as a baby crib. The exhibition has competition of ideas for a baby package to be used longer with the objective to show that design and product creation make society affluent and create sustainable society where materials are valued for longer use. It is also aimed at sharing important memories in the family and the society so that we can create the society where people share joy of life. What is the good message we can send to newborns and their mothers in the era where we face serious low birth rate? What is a “nation kind to mothers? I hope the exhibition will give visitors an opportunity to think through the experience of Finland. The society is filled with personal thoughts and feelings. Being social allows people to share these sentiments. Japanese youths may have already been aware of the fact that the society is evolving from individualism to shared society. Let us celebrate and share the joy of new life. ✽1 The World Happiness Report (reported by UN on March 14, 2018) *Japan ranks 51st. ✽2 Mothers can choose the benefit either in cash of 170€ (from June 2018) or a baby package with baby clothing and care products. Two thirds of 60,000 households in Finland receiving the benefit choose a baby package each year. ✽3 “Mother’s Index Ranking in 2017” by Save the Children *Finland ranks 1st and Japan ranks 32nd.